The myth of the saloon as cast in movies, television, and literature has fossilized the institution, making it difficult to imagine a reality beyond the cliché. Still, a real place on the western frontier lurks behind the myth. 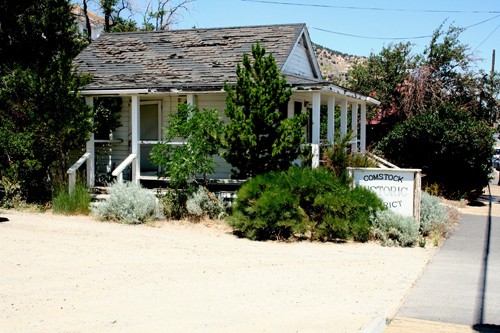 Virginia City’s saloons were centers of life. Besides offering drinks, many provided meals and other distractions. Barkeepers sought to distinguish their enterprises with choices in décor, food, and drinks. While some saloons catered to specific ethnic groups, others pitched to different parts of the market. From humble to expensive saloons, there was something for everyone’s interests and price range. 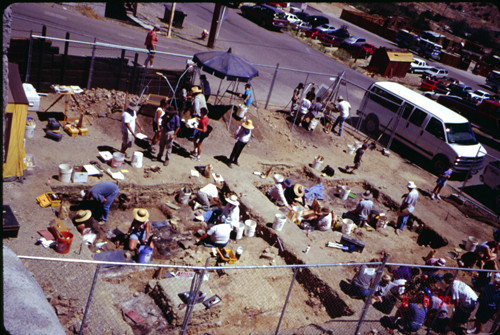 Archaeologists excavated the remains of four saloons in Virginia City, Nevada between 1993 and 2001. They discovered a new story that tells of saloons in a complex reality. Nearly 300,000 artifacts emerged from the sites of Shanahan and O’Callaghan’s Hibernia Brewery and Saloon, O’Brien and Costello’s Shooting Gallery and Saloon, John Piper’s Old Corner Bar, and William A. G. Brown’s Boston Saloon, an African American place of leisure. Archaeologists retrieved bits of rusted metal, broken glass, and broken pottery as well as complete bottles, plates and other remnants, each shattered gems from a distant time, offering the chance to balance legend and truth. The excavated material subsequently became part of an exhibit, “Havens in a Heartless World: Virginia City’s Saloon and the Archaeology of the Wild West,” funded by the Institute of Museums and Library Services with the assistance of Senate Majority Leader Harry Reid. This online exhibit provides a wider audience with the opportunity to see marvelous artifacts and understand the saloon of the Wild West. Photograph courtesy of Kelly J. Dixon. Archaeologists recovered roughly 300,000 artifacts from four saloon sites in Virginia City. These included the world’s oldest bottle with a Tabasco Pepper Sauce imprint, a two-foot-tall ceramic carbon water filter from London, and a wide assortment of bottles, gambling devices, plates, glasses, and other objects associated with saloon life. The Hibernia Brewery and Saloon was south of the Barbary Coast on the main street. It served the Irish and had a contract with a brewing company so it could offer beer on tap. The décor and food were some of the poorest in a Virginia City saloon. The Hibernia opened in the 1880s. Nothing except archaeology remains of the building. 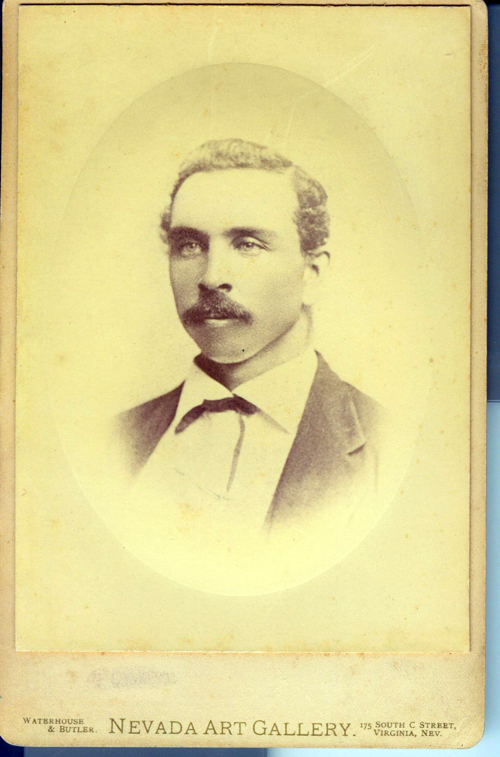 William A. G. Brown was a free-born African American from Massachusetts. He opened the Boston Saloon in 1866 a block down from the main street, providing a dignified place for African Americans. Brown offered the best cuts of meat, fine crystal glasses, and some of the best lighting of the four excavated saloons. Artist and writer, J. Ross Browne drew a picture of Virginia City’s “Cozy Home” in 1862. Browne reveled in the outbreaks of violence that were certainly inevitable when mixing alcohol and firearms. Fighting, however, was rarer than the Browne’s drawing might indicate. 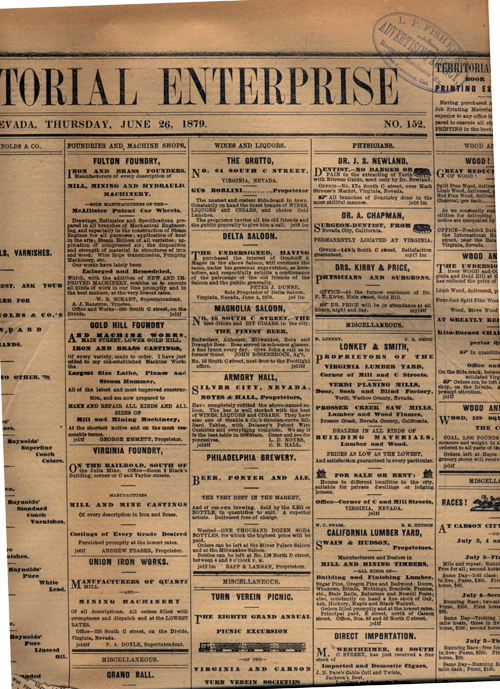 Virginia City’s Territorial Enterprise carried advertisements for diverse saloons. 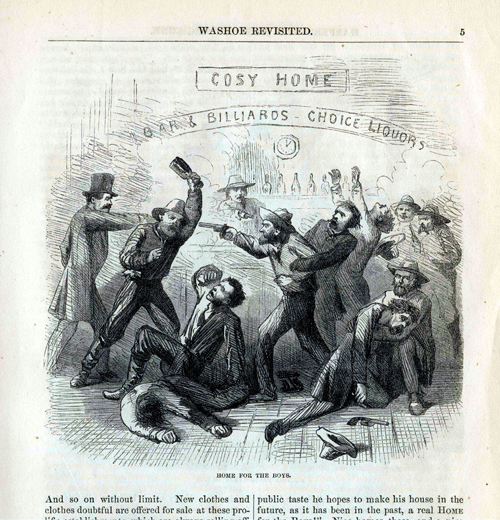 The 1867 Delta Saloon ad mentions a reading room. Others indicate a range of attractions, including billiards, bowling, and shuffle board, as well as the types of food served. Saloons distinguished themselves according to the cost. A one-bit saloon sold a cigar, a beer, or a glass of whiskey for 12 ½ cents. A customer, who paid with “two bits,” or a quarter, could receive a “short bit,” or a dime as change. It was equally possible to buy a drink with a “short bit,” so change evened out. 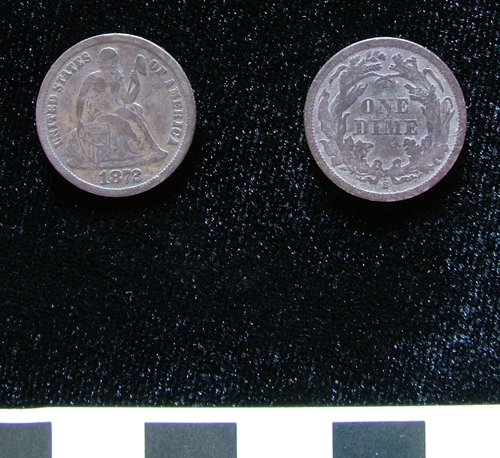 The photograph shows two dimes from Piper’s Old Corner Bar. The term “bit” originally referred to a fraction of the 18th-century Spanish coin with a value of 8 reales, the famous, silver piece-of-eight. It served as a principal currency for early America and a basis for modern currency. The Spanish dollar was halved into various fractions for use as currency of lesser value. The smallest fraction was called a “bit” and worth 1 real (1/8th of a dollar or 12 ½ cents). Thus, our quarter dollar or 25 cents is still referred to as 2 bits. 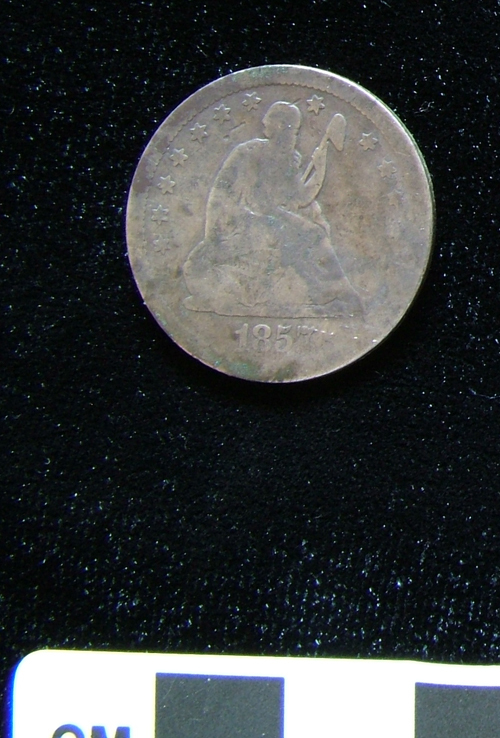 Photograph shows a quarter from Piper’s Old Corner Bar.